Can the problem of data vulnerability at rest be solved by a piece of hardware? The Aegis Padlock SSD is one of the toughest and most secure drives on the market. It is expensive and slow, but otherwise fulfills the role of being an impregnable guardian of your data in a post-GDPR era. In a market where differentiation is becoming more difficult, Apricorn has been trying something different for a few years already. Its Aegis Padlock SSD range of external drives boasts an encryption layer with a dedicated numeric keypad to enter your PIN. We tested the 120GB version but it is also available in 240GB, 480GB, 1TB and 2TB models. Suggested retail prices at the time of writing at Apricorn’s US website started from $249 (£185) running all the way up to $1,039 (£775) for the biggest capacity, a significant premium over other regular external drives – but let’s delve deeper to find out whether that’s justified. The drive itself is bigger than the competition (the Samsung T5 or the Adata SD700 for example) but it’s aimed at a completely different market where data protection is the priority, not whether it will fit in your front jeans’ pocket. Its dimensions are 64.5 x 83.5 x 14mm with a weight of just over 100g. The Aegis Padlock is protected by a crush-resistant aluminum enclosure and is IP56-certified (protected against dust ingress and water jets). The dark grey chassis hosts a 12-key numeric keypad (10 digits and two padlocks) that’s medical-grade and wear-resistant to prevent potential intruders from guessing the most-used numbers. Three status icons will also inform you about data transfer and whether or not your drive is unlocked. Just be aware of the fact that there is a very short USB cable (with a Type-A connector) attached to the device, and that this should be cleaned and dried after any water projection when connecting to a client device, for obvious reasons. Having the USB cable attached in such a way can be a source of trouble if it is ever damaged or if your host machine - as is the case for new laptops - only has USB Type-C ports. The components inside the device are, according to Apricorn, stuck in hardened epoxy (which is used in glue), which means that it is near impossible to remove them to extract data from the chips. The drive comes with a couple of leaflets (including one titled: ‘Some small print from our lawyers’) and a pouch to protect the device. One of the drive’s main selling points is that it meets the requirements for FIPS 140-2 Level 2 validation by the US government. The drive also supports 256-bit AES XTS encryption through hardware rather than software, which means that it doesn’t rely on the host computer. Foregoing software means that you don’t have to install an application on any device. That has two advantages: firstly the encryption solution cannot be compromised since it is on the Padlock SSD itself, and secondly, the lack of a software stack eliminates the risk of any vulnerability and makes it truly software agnostic. Not surprisingly, the physical numeric keypad also removes the risk of key-loggers and brute force attacks. Just be aware that if you enter the PIN incorrectly between 4 and 20 times, your data will become inaccessible as the encryption key will be destroyed. Apricorn has even engineered a self-destruct PIN; type it in and your data will vanish. The drive doesn’t come with a built-in battery which means that any admin task (changing the PIN code etc) will have to be done when connecting to the host device (which will provide the necessary power). That’s not very practical if you don’t have access to front USB ports on, say, a desktop PC. Though not confirmed, we expect that the device uses SLC rather than TLC NAND to improve the longevity of the drive, which would also explain the high cost of this product. In terms of performance, the Padlock SSD performs poorly, scoring as little as 158MBps and 162MBps respectively in read/write speeds in CrystalDiskMark, which is less than half the next slowest SSD we’ve tested. The fact that data is being encrypted on the fly explains why it is so sluggish. The bottom line is that you shouldn’t buy this drive for speed, but for how well it protects your data at rest. 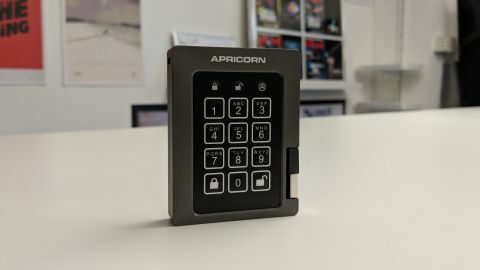 Here’s the thing – Apricorn sells four ranges of rugged, encrypted external drives with little differentiation in between. The Aegis Bio uses biometrics (finger swipe) rather than a keypad, which means that it can only be used by one person. It is cheaper but doesn’t come with an IP rating or capacities higher than 512GB. But the Padlock SSD, the Padlock and the Fortress are far less differentiated other than in terms of price and storage capacities; the last two offer capacities of up to 8TB. The other big rival to the Padlock SSD is the Datashur range from arch-rival iStorage which uses the same guiding principles as the Padlock SSD. We’re talking about a tethered USB cable, a physical keypad, XTS hardware encryption and FIPS validation. The suggested retail prices of the iStorage range roughly match that of the Padlock SSD range, but claimed performance is significantly higher for the range, and iStorage bundles Nero BackItUp and Eset Drivesecurity software packages as well. The drive comes with a three-year warranty which is great. However, its relatively poor performance and high price make the device unappealing to a large swathe of potential customers. However, those who will look to buy such storage solutions - think public sector - will focus on its security credentials where the Padlock resolutely shines. At the end of the day, the Padlock SSD does the job, although the setup process is a bit cumbersome (and not helped by the short USB cable).